Small group so limited spaces – booking is essential! This coming weekend is set to be sunny & warm so join us on the beach! A 2.5hr masterclass with Louise to learn how to incorporate inversions and arm balances into vinyasa flow! 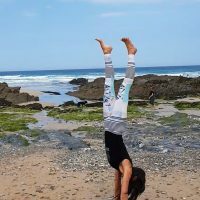 Our HANDSTAND & HANAMAN special ‘Learn to FLY!’ Beach Playshop will explore a variety of ways to get upside down safely and work towards full splits using the natural props that the beach has to offer. This class will be a lot of fun!! We’ll share our tips and techniques for balancing on your hands with ease & grace. Expect creative vinyasa sequencing with pauses to practice balancing on our head and hands before mixing them back in through safe and fun transitions! This class is suitable to those that have an existing vinyasa practice. You do not already need to be able to do arm balances & headstands but come with an adventurous attitude to giving things a try!